Graduation cap and stethoscope representing medical graduate. Photo courtesy of Shutterstock. Congratulations on graduating from medical school! Now comes finding a job. What factors will you consider? Perhaps, you will think about the type of facility to work at or even the location of the job. 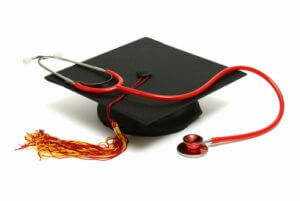 However, first you should decide what area of the medical field you would like to get into.